Is there any way to debug bash script without using echo and logging? I'm talking about using breakpoints and stuff like that. Yes there is Bash Debugger Project. You can also use set -x and set-v at execution. HERE and HERE or HERE is some info on that. 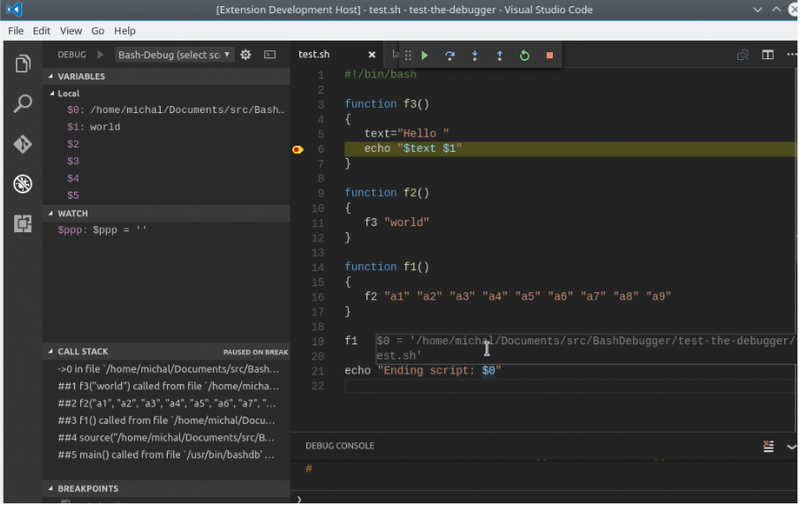 Nowadays, there is the Visual Studio Code Bash Debug extension. It has 'Step in/out/over' and can show the value of each variable. I also added "vars" command which will dump all the available variables and their values. You can add your own customized commands as well. I did the code in few minutes so use it under your own risk. Be aware that in debug mode any command can be executed, so it poses a security risk if you leave it in a production script. 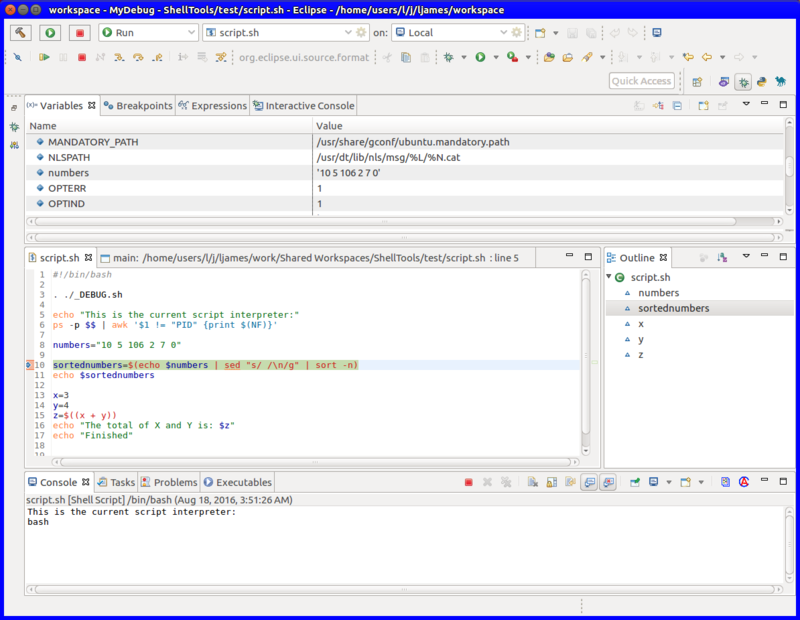 A GUI option for debugging a bash script is the Eclipse IDE with the BashEclipse/Shelled pluggins. This gives the features of your question (breakpoints and stuff) along with a host of other features for debugging complex bash scripts. 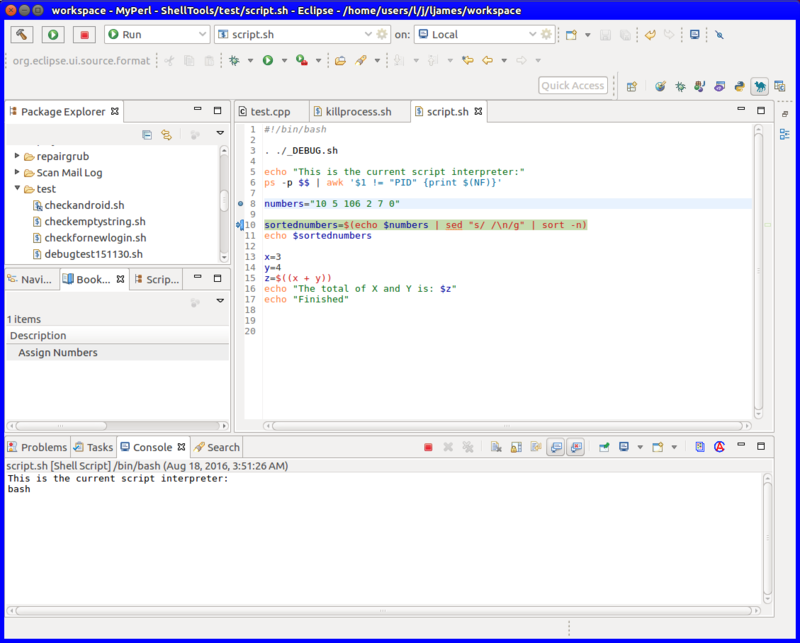 The steps for using is to add the Shelled and BashEclipse pluggins to eclipse. Then run the procedure provided in the BashEclipse read me text file to start the debugger. To the tune of what NES is saying there are set flags in bash to allow for debugging. echo -n "Number of users: "
set -f Disable file name generation using metacharacters. 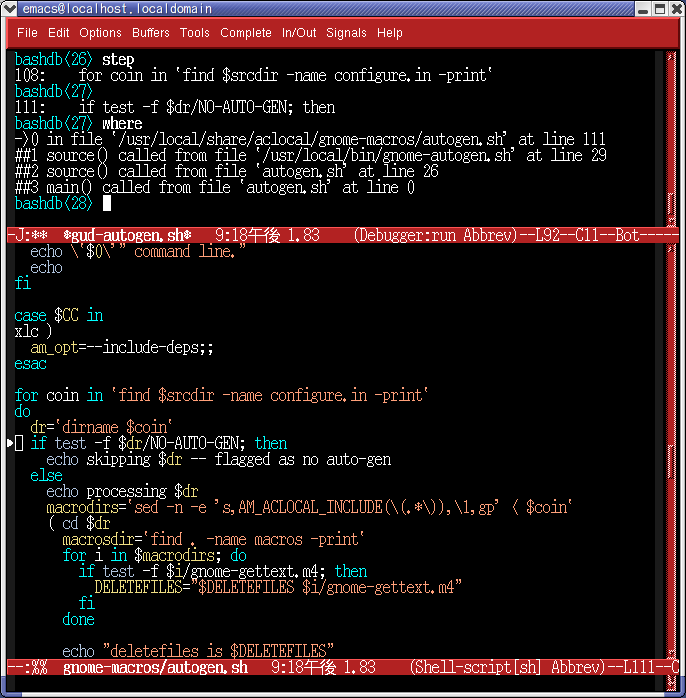 set -v Prints (verbose) shell input lines as they are read. set -x Print command traces before executing command. set actually has many features, but woefully no man page as it is a shell built in tool. The manual for set is in the GNU Bash documentation. file determine a file type. and numerous others. I was trying to think of the command that shows hidden characters, but I cant do it right now. Hexdump will do it but there is a better one. The key command ctrl\ will cause a running program or script to core dump. Then you could analyze the coredump. I would probably use gdb to analyze a coredump, but many programs exist for that. The bash shell has some nifty options for debugging too. options --debugger, -v verbose, --dump-strings and other nifty options to assist you. Check them out using man bash. The trap command (shell built in) could be very helpful for you. trap says if your program exits unexpectedly, execute something. You read about trap, and other handy Bash Shell builtins here. Speaking generally for the moment, debugging is a huge topic in any language. Some other topics that can be handy for debugging in any programing language include, shell redirection and, signal processing. Finally, I realize the example I used is trivial, but that some shell scripts can be hundreds of lines. In those situations, I like to either insert comments tags and block out code I suspect is faulty, or Alternatively, insert an exit command, and try to isolate the functional code from the broken code, using a divide and conquer technique. How to get colored output from bash script? How to output commands when running lynx from bash script?